A dental bridge is a restorative dental procedure that can be used to replace one missing tooth or several adjacent missing teeth. If you are missing one or more teeth, a dental bridge can be used to restore your smile and prevent your remaining teeth from shifting out of position. It can also serve to restore your ability to properly chew and speak and maintain the shape of your face. A traditional dental bridge involves creating a crown for the abutment teeth (the teeth on either side of the missing tooth or teeth) and a pontic (false tooth) in between. In most cases, bridges are made of either porcelain fused to metal or ceramics. Although this method has been used to successfully replace missing teeth for many years, it does have some drawbacks. For starters, a traditional dental bridge is not a permanent solution for tooth loss. Most dental bridges will last around ten years, with proper care, although they can last longer in some cases. Also, since a traditional bridge rests over the gums, it can lead to deterioration of the bone and bone loss. 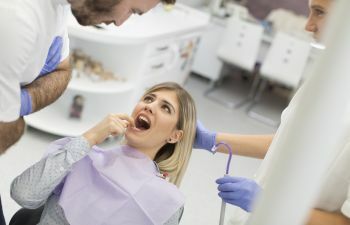 Since the pontic rests over the gums and is not anchored by a root, the chewing pressure with a dental bridge is not as strong as it would be with an actual tooth. This can make it difficult to properly chew and digest certain foods. Finally, the process involved in preparing the abutment teeth for crowns can weaken these teeth and leave them more susceptible to future problems. Dental implant supported bridges provide a longer-term and healthier alternative to traditional dental bridges. This process involves placing prosthetic tooth roots into the jawbone and allowing them to fuse with the bone. After the jawbone has properly healed and the implants are anchored firmly into place, a dental bridge can be attached to the implants to take the place of missing teeth. The result is a fixed solution to missing teeth that looks, feels and functions like natural teeth. While it is true that a dental implant supported bridge costs more than a traditional bridge, the advantages far outweigh the extra cost for many individuals. If you are missing one or more adjacent teeth and are considering a dental bridge, talk with your restorative dentist today about traditional and implant-supported dental bridges. He or she can help you determine the best tooth replacement option to suit your needs and your budget.